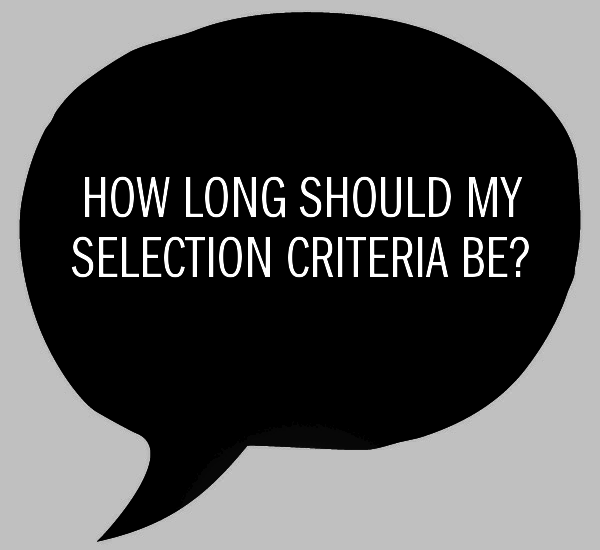 How long should selection criteria be? 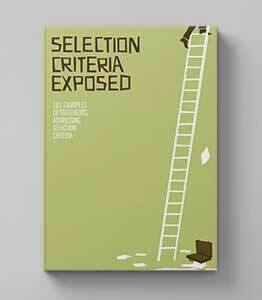 How Long Should My Selection Criteria Be? My advice is always three quarters to a full page PER selection criteria. Just to be clear, each selection criteria should start on a new page and be separate from your cover letter and resume. . . .you should ALWAYS check the selection documentation which will often have a suggested length or word limit. If there is a suggested word limit, try and keep as close to it as possible. For example, if the word limit is 400 words per selection criteria, the perfect length would be just under 400 words. Anything less than 300 words would not be sufficient. Just imagine, your competitor for the position has written 395 words with powerful examples that substantiate their claims against the position. And you have only presented three quarters of what you could. If you want the interview, it's worth the effort! I also recommend writing your document in narrative style. That means it will read like a story, rather than be a list of bullet points. While there is nothing wrong with bullet points, my experience shows that a narrative style allows you to explore the selection criteria and your examples more fully and lead the reader through your claims at your own pace. I have also noticed that those who are picked for an interview based on their written application very rarely use bullet points. If you include bullet points, the reader is more likely to skip over your application and skim over your points, only focussing on the points that stand out. 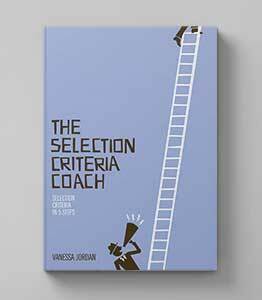 If you think of your selection criteria answers as a sales letter, your job is to take the reader on a journey, create an emotional connection between what they want (in terms of an applicant and their skill set) and what you can deliver and address any objections that they may have to you being the perfect applicant for the job. The exception to avoiding bullet points is if there is a very low and strict word limit. In this instance, bullet points can serve you well as they will reduce the amount of words you need to use.